Dietz Edzard grew up in the city of Bremen in northwestern Germany. Although there has been a settlement along the banks of the Weser River since prehistoric times, Bremen is perhaps best known as a member of the late medieval Hanseatic League in which the merchant guilds in north German towns banded together to protect their commercial trade interests. By the late nineteenth century, there was no longer a Hanseatic League, but Bremen remained a thriving mercantile center with a newly relocated port at Bremerhaven on the nearby North Sea. Edzard was born into one of the city’s trading families on March 30, 1893. His parents Conrad and Magda welcomed a second son, Cornelius, five years later in 1898. Dietz Edzard completed his education at age sixteen, and was then apprenticed to an import/export firm specializing in the wool trade with Great Britain. His next step was unexpected. The story goes that he was rambling through the outskirts of town after abandoning his art studies with Trubner and came across a traveling circus. Apparently he became enamored of one of the rope dancers and decided to join the troupe. Over the next few months he learned how to be a rope dancer himself and eventually arrived in Stuttgart with the circus. There, he began pursuing his art studies again, circus life presumably having lost its glamour. [ii] It was in Stuttgart that Edzard made friends with a group of young painters who had formed a loose-knit group; this gave him an opportunity to continue developing his skills in drawing and painting in a congenial and supportive environment. 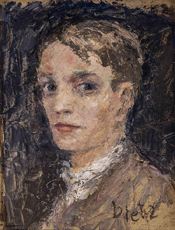 In 1911, he set out for Berlin where he studied with Max Beckmann (1884-1950). Life for a young artist in Berlin during this time was full of excitement as well as tension. The new ideas emerging among the Expressionist artists, like the members of Die Brücke, were both fascinating and challenging. Their work echoed some of the Fauve experiments occurring in Paris at the same time, but there was a distinctive edginess to the German avant-garde caused by the collapsing political and social structures of the society. It was becoming increasingly obvious that the outdated customs and mores of the rigid imperial class system were falling apart. With the onset of war in the summer of 1914, Edzard found himself in the infantry, facing all the horrors of trench warfare. When he became ill because of the appalling conditions, he was transferred to the Eastern Front where the German Empire was fighting the Russian troops of Tsar Nicholas II. Edzard was stationed in the westernmost region of Latvia known as Courland; he fared no better there, however, and was sent to a nearby sanitarium to recover. His illness was not only physical, but psychological; today, it would be called post-traumatic-shock disorder. The outdoor work at the sanitarium seems to have helped him to regain his physical well-being, and he was able to take up painting again while he was a resident there. In addition, he organized an exhibition of his work at the Gurlitt Gallery in Berlin in 1916, where he met the art collector Eduard von der Heydt who purchased a number of his paintings. Many of his canvases from this period reflect the terror of the war. In Petite fille triste, 1917, for example, the painter depicted a solitary and very thin girl, her wide staring eyes filled with horror. Her body is rigid as are the claw-like hands at her sides. She seems absolutely still in the face of the unseen terror that she witnesses. Unfortunately for Edzard, he was returned to active military duty in 1918, which reignited all of his previous nightmares. This time, he was sent to an asylum for the mentally ill, which proved to be an equally harrowing experience. When he was finally released in 1919, he made his way to Amsterdam, where he stayed with a friend to recuperate. Gradually, he began to paint again and was able to put together enough work to exhibit in Amsterdam and The Hague in 1920. The influence of the German Expressionists is evident in this work, both in the dramatically angular human bodies and in the use of Christian iconography that has been transformed into images of twentieth century dread. Even The Christ Child, 1919, is a study in panic; in spite of the aura of light surrounding him, the newborn baby seems deeply frightened by what he sees. This is not a comforting story about the birth of a savior, but a depiction of a terrible vision of a future filled with torment. The Descent from the Cross, also from 1919, shows a predictably sorrowful scene of the dead Christ and his mother, but without any of the symbols of hope that traditionally accompany this moment in the story. Despair has triumphed in Edzard’s world. Happier times arrived in 1921 when the artist moved to Bavaria, far from the barbaric reminders of the northern German battlefields. There, he met the woman who would become his first wife, and he became a father for the first time. For the next six years, Edzard painted the countryside of Bavaria, including the spectacular vistas of the Black Forest. Although little is known about the circumstances, he also seems to have participated in an exhibit in Rome in 1923. [iii] Three years later, he ventured outside of his home region to paint in Lithuania, and exhibited some of his recent work at the Galerie Flechtheim in Berlin in 1927. A year later, he left Germany for good, moving first to Provençe and then to Neuilly immediately west of Paris in 1928. The reason for the move is not entirely clear, although his wife and child do not seem to have accompanied him to France. Whether the marriage ended or something else happened remains unknown. His early years in Paris were quite successful. In 1928, he was part of an exhibition at the Galerie Durand-Ruel, which traveled to New York later in the year. In 1929, he was exhibiting in Brussels and in 1930, his work was shown at the Galerie de Boer in Amsterdam. The canvases from these years included a variety of subjects from street musicians to clowns, acrobats and unicyclists. Edzard’s short career as a rope dancer with the circus seems to have graced him with an appreciation for performers of all sorts as well as an understanding of the hardship of this hand-to-mouth existence. These types of figures will remain a part of his repertoire throughout his career. During his first years in Paris, he also established himself as a portrait painter. Of particular note is a portrait of the American journalist, “Red” Knickerbocker, who accompanied the artist’s brother, Cornelius, in his attempt to fly across the Atlantic in August of 1927. [iv] Knickerbocker was based in Berlin from 1923-1933, but must have visited Paris to sit for his portrait shortly after the attempted trans-Atlantic flight. Like many of Edzard’s paintings, the journalist seems to be reflecting on his inner thoughts rather than engaging with either the artist or anyone else. Edzard’s portraiture from the 1930s includes both conventional canvases of society beauties such as Young Woman Looking at a Fair (1929) and more intimate paintings without all the accoutrements of the more formal images. Young Woman with Pink Shawl (1932) for example, is a bust-length depiction of a young woman posed simply against a grey background. Its success depends more on the psychological depth the artist has captured than a stylish suit or elegant setting. 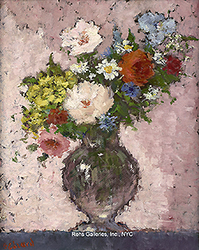 Throughout the 1930s, Edzard’s work was consistently exhibited at galleries in major European cities as well as New York. There were shows at the Leicester Galleries in London in 1934 and 1936. In New York, his work was included in the Galerie Durand-Ruel exhibits in 1935, 1937 and 1939. And in Paris, he had an exhibition at Galerie Zak in 1933. In short, his career was thriving. His personal life also changed significantly during this decade when he met a fellow artist, Suzanne Eisendieck (1906-1998). She arrived in Paris from Berlin in 1931 and began to exhibit with Mme. Zak at the Place Saint-Germaine-des-Prés in 1932. The details of their initial meeting and courtship remain vague, but Edzard and Eisendieck married in 1938 in Paris. The outbreak of hostilities between France and Germany in September 1939 would prove challenging for the newlyweds, as it was for everyone living in Paris. There were no exhibitions and very few art patrons. Edzard continued to work throughout World War II, focusing on still-lifes of flowers and interiors as well as a handful of images of single female figures. These are not portraits, but simple solitary women wrapt in their thoughts. The terror-stricken eyes portrayed in his post-World War I female figures is gone, but these compositions creating during World War II possess the same internally focused stillness of the earlier works. Edzard’s personal response to the war seems more contained in 1939, but no less stunned by the unfolding atrocities. By the end of the war in 1945, however, Edzard and his wife had a double cause for celebration—not only peace, but the birth of their daughter, Christine. Two years later, another daughter, Angélica, arrived. After the war, Edzard produced some of his most memorable canvases. La Famille dans la Loge (1946) is particularly notable as a statement of faith in the family after a lengthy period of grim hardship. 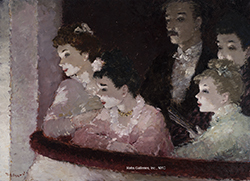 Although the figures wear fashionable clothing as they watch events unfold on stage, the date of the painting inevitably evokes the privation of living in Paris under Nazi occupation for the previous five years. Edzard’s painting celebrates the survival of the family, the pleasures of Paris and the importance of cultural activity as part of a normal life. As France regained its footing in the aftermath of the war, Edzard’s career also took on new life. He began exhibiting at Arthur Tooth & Sons Galleries in London in 1952 and at the Galerie Pétridès in Paris in 1953. Scenes of people enjoying ordinary life in the city, such as Lemonade Stand in the Tuileries Gardens (1953) formed the core of his work during these years. In 1958-1960, Edzard began painting in Venice. He was following in the footsteps of many generations of artists, but he developed an atypical perspective on the usual canal scenes. Rather than concentrate his attention exclusively on the magic of the water, he positioned himself behind large bouquets of flowers on the balconies of the houses along the canals. The view of the gondolas, churches and palaces in the distance was thus filtered through the immediate beauty of the blossoms in the foreground. There are also scenes from the Venetian theatre and of course, carnevale. During the 1950s and 1960s, Edzard and Eisendieck began showing their art together, especially in the United States. From 1955 to 1962, the couple had annual exhibitions at the Edgardo Acosta Gallery in Los Angeles; and from 1957 to 1962, at the Wally Findlay Gallery in New York, Chicago and Palm Beach, Florida. These shows not only introduced their work to the expanding post-war art market in the US, but also assured them of a secure and steady income. Edzard’s last exhibition was at the Hammer Gallery in New York in 1962. He died in Paris in 1963. [i] Florent Fels, D. Edzard, L’art et la vie (Paris: Editions Marcel Seheur, 1929) 5. [ii] Fels included this story in D. Edzard, L’art et la vie and it has been repeated elsewhere as well. There is no evidence to support what seems like a romanticized account, but neither is there any evidence to refute it. [iii] Claude-Roger Marx, D. Edzard, Tableaux de 1917 à 1963 (Paris: Quatre Chemins-Editart, 1971). n.p. Marx lists an exhibition in Rome in 1923, but provides no other identifying information. [iv] Ibid., pl. 23. The artist’s brother, Cornelius Edzard. was an early supporter of air travel, serving as a volunteer pilot during World War I and subsequently as an aviator for a number of early German airplane manufacturers. In early August of 1927, Cornelius Edzard, Johann Risticz, along with Red Knickerbocker, flew for 52 hours and 22 minutes in a Junkers W 33 in an attempt to cross the Atlantic. Unfortunately they ran into a storm and had to return to the Bremen airport with a damaged plane. Hubert Renfro “Red” Knickerbocker (1898-1949) was a Texas-born, Pulitzer Prize-winning journalist who is best known for his reporting on the rise of Nazism in the 1920s and 1930s. Although Hitler had him deported in 1933 when he came to power, Knickerbocker continued to sound an alarm about the threat of Nazism from his base in New York. [v] Gerd Muehsam, D. Edzard (New York: H. Bittner and Company, 1948).